Happiness is in the mind, not in outside events and circumstances. Beautiful things happen when you distance yourself from negative thinking. There is an opportunity in every difficult situation to understand yourself more deeply, and also to improve your life. I encourage you to reflect on recent situations where you’ve felt let down – where life’s outcomes were nowhere near as good as you expected. Rather than focusing on the uncontrollable things that were “done to you,” consider instead your part in what went down. For example, perhaps your gut told you not to do something, but you did so anyway. Or maybe you were deceived a second time by the same person, and wish you had let go of the relationship sooner. Or perhaps you just weren’t paying attention and ended up missing out on a great opportunity. It’s so easy to be negative when things go wrong, or blame others for negative outcomes in your life. But do negativity and blame change anything for the better? Truth be told, the best time to be positive and take responsibility for your happiness is when you don’t feel like it. Because that’s when doing so can make the biggest difference. No matter what the specifics of your troubled times are, taking a moment to look inward at what you could have done differently and how you could potentially avoid similar situations in the future can be a healthy exercise. This is not to blame yourself or shame yourself, but simply to give you the opportunity to learn, on a higher level, from your experiences. It’s about learning to choose the most effective response in a difficult, uncontrollable life situation. It’s about learning to think better so you can ultimately live better, no matter what. But how exactly can you change your negative attitude and adjust your inner dialog in the heat of the moment? Note: If you’d like attend next year’s “Think Better, Live Better 2019” conference on February 9-10 in San Diego, you can check it out here. What has helped you stay positive when life gets overwhelmingly difficult or frustrating? We would love to hear from YOU in the comments sections below. I appreciate how you segmented this short clip from your full conference. I actually first watched the digital recorded version of your event a few months ago when it was first released, and I’ve since re-watched various parts of it just to keep these teachings fresh in my mind. One of the key things I’ve been working on recently is to stop my negativity is the self-inquiry process you discuss later on in the conference. This process combined with regular reminders (your emails and other positive online sources, for example) have been the source of my inner growth. I enjoy your emails, they help me a lot, I have many things going on I’m my life but the worst time for me at times in late at night, since my divorce it is so rough being a lone. But, you help a lot to think differently. And I am working on my goals. I just found this web site. It is help me a lot, too. Specially Donna, your situation and mine are same. I’m divorced and being all alone in diffrent state without my kids, (adult) family anfd friends. lost my job and life savings. It’s 9 month went on. First 6 month was actually pretty good start… but all sudden dark feeling came in and a lot loney than ever before. Cry every day and night. Seeking something to up lift myself. This site actually help alot and I feel better. You are not alone. I am not alone. Thank you for shareing. 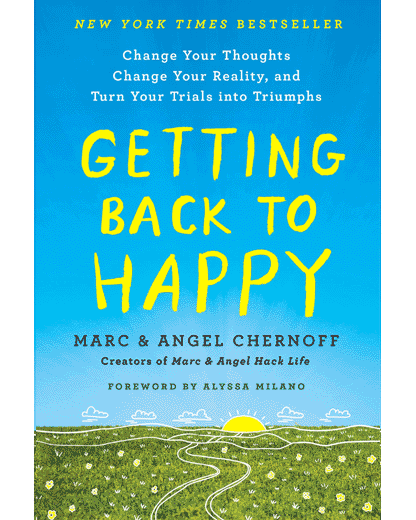 Marc and Angel, I attended your conference earlier this year in Austin, and your strategies and perspectives had an incredibly positive impact on the past several months of my life. This short clip was a great refresher. Also, like Michelle above, it really helps to have positive reminders, which is why I have read and re-read your parts of book and many of your articles several times over the past year. Doing so has helped me stay on the right path. It was so nice meeting you at the conference. And it’s inspiring to hear that you’ve made progress over the past few months. Thank you for supporting our work and being a part of our community. Another one of your blog updates/emails arrives in my inbox at the perfect time. Seriously, this is an excellent video and great points that directly pertain to one of my biggest personal struggles: negativity. Thank you for giving me some new tools. Cheers to being present, refocusing our thoughts, and making the best of why we’ve got! I would love to see this whole seminar too. We would love to have you at the next event, Cara. If you’re on our email list, more info about the next event is coming soon. Thank you Marc and Angel for sharing this article and video! I use meditation a lot in order to stay focused in the moment and not have too many negative thoughts or concerns about the future. It is a difficult practice but that’s what works for me. I hope your conference comes close enough for me to come, Little Rock, AR or Shreveport, La. I’d love to hear more. Negativity has been a huge part of my life, I believe I learned the behavior from my mom & my daughters learned it from me. I want to break that cycle. I get excited about changing that behavior when I read your information. The next conference will likely be on the east coast (potentially Florida… which isn’t too far from you). Well said and true indeed. This post was great! I never usually read these kind of articles and when I read them I always leave in the middle… but this one caught me… and I read and watched it, and appreciated it. To tell the truth. I am a very negative person. I have been told so by many other people…..and I believe it…but this post is transforming my thinking… THANK YOU VERY MUCH. My home is lovely and my partner (spouse) is kind. I live in the country and have a condo in Florida. I couldn’t ask for more material things. I’m 70 now. I fell for a woman online in Florida that started out with kindness and fun. It just happened as she too is an artist. Two years my senior. She turned nasty. I posted a painting of Hillary for general public. She saw it and went ballistic and said I did it to hurt her.. I was shocked. Didn’t know she hated Hillary. i said her blue eyes were like Hilary and she went nuts with my comparison. I held on knowing to let go. She just Unfriended me. The last post I sent she took real offense to as I defended myself. She also blocked messenger. Now I’m taking Xanax and know it’s over. Your work helps me. As always, a HUGE thank you for your insightful tips and reminders. They have helped me tremendously over the years. 🙂 When life gets difficult/frustrating, I just try to remember how much worse things could be and the fact that some people would love to be able to have my issues instead of their own. My current contract in the Middle East isn’t ideal, when compared to previous assignments. However, it really isn’t that bad. Whenever I glance outside of my window and see the poor laborers from the Indian subcontinent toiling in the relentless heat for a pittance, I’m quickly reminded how much I have to be thankful for – comfortable airconditioned home and work spaces, a decent salary and many opportunities to indulge my wanderlust. The realization that I still have much to be grateful for, when I’m inclined to throw a pity party has helped to keep me positive. I’m sorry that I won’t be stateside in 2017, but I look forward to the privilege of attending one of your conferences at a later date. Thank you for including a clip of your wonderful conference. This is something that I have to keep reminding myself to do, and one day I hope that I’ll have trained myself so much that I can be naturally positive without having to remind myself. When I feel my head spinning on my shoulders, I STOP, take a deep breath, close my eyes. I ask myself ” what do I LIKE about where I am right now”. Or, ” what’s working in my life”. This takes you off subject ( which at that time is negative), and forces you to seek out and find what IS working in your life. And there is ALWAYS somethings that are good and right. What always keeps me centered through the challenges of life is to wake up every day with gratitude for my health an date health f my family. I make good choices, and while everything does not always go my way, those good choices, be it food, friends, work, minimalism, lead me in the right direction. You constantly help me not to take external things so internally. I struggle with it daily. Lately though the external things are what my grandchildren teenagers are doing that is not legal. We all live in one house. The parents don’t seem to do anything about it. They work so I am home with them. I have given up saying anything to the parents about their activities, but it hurts me internally. I see their lives going down a bad path. I don’t know what to do. I have basically given up and this makes me feel very bad inside. It’s hard to see the positive. It’s hard to step back and say it doesn’t matter as I am the grandmother. I have purchased your book. Marc and Angel, you both are so wonderful, thanks for sending me this video, looks interesting and really helpful, I didn’t have the opportunity to meet you guys but any article you send me feed me and has a lot to share to me, thank you very much. Thanks for sharing the clip of the conference. Short but yet very powerful. Hope you reach many ears and hearts with your powerful message. What helps me to stay positive when the negativeness of life become overwhelming? Well it is gratitude. when I’ve encountered a negative situation, I make sure I distance myself to understand it, process it and let it go. That is what helps me cope with the negativity in life. Loved this segment! Always read your blogs, but because I learn better visually, this had an extra impact….and it came at literally, the right time. Am in a situation I have no control over and hearing/watching this made me realize not to focus on what is uncontrollable (and make myself crazy) and instead re-focus on the positives in my life and be grateful. You have helped me so much with thinking “gratitude” and what I do have instead of what I don’t have. THANK YOU SO MUCH! Keep up these little videos.! “The best time to be positive and take responsibility for your happiness is when you don’t feel like it. ” That’s so golden, and so true. I went through a hard time recently and heard and interview with Bruce Kramer, who recently died of ALS. He said something that forever changed the way I approached adversity: “How shall we grow into the demands of what is beyond us?” Whether it’s a terrible diagnosis or a dysfunctional relationship, we always have the choice to face what comes with dignity, integrity, and joy. Wonderful ideas to live by. May the Lord Christ keep on blessing you again and again. The first thing I ask myself is how did I affect this circumstance. What can I learn for the future? How can I make whatever is happening better? Then, I ask myself, what is God teaching me here and what am I supposed to do? This absolutely helped me rework the way this rather stressful and frustrating day went down, helping me to put it all behind me and set myself up for a good night’s rest and a positive outlook for tomorrow!